Bill McKibben, writer, activist and founder of 350.org is on his way to the White House with students from Unity College in Maine to symbolically return one of the solar panels that President Jimmy Carter had installed back in 1979. 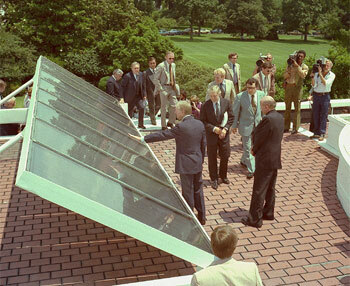 Unfortunately Ronald Reagan had them removed when the roof was repaired in 1986 and never had them reinstalled. What could have, and should have, been a momentous shift from fossil fuels to renewable energy was lost. But hopefully we can get back on track…31 years later and at a time when we need to embark on this shift even more than we had back then. Let’s not miss this opportunity or another 31 years could go by and the world might look very different in 2041. We are at a critical time right now and we need to reverse the course that we are headed on, and that means decreasing the amount of carbon in the air to below 350 parts per million in the atmosphere. You can read more about this at 350.org. You can ask President Obama to put solar panels back on the White House by signing this letter. Sungevity, a company in California has even offered to donate a $100,000 solar installation so that this doesn’t cost taxpayers one penny-but it is great publicity that is surely worth more than $100,000. Here is their proposal for the White House. If you live in California and have a house they will send you a free quote, and a Globama t-shirt. Now is the time for utilizing the power of renewable energy, we have the technology available and it really works-this is not science fiction any longer. America has lost the lead in this field but we can regain it and this would mean jobs and a huge new sector for stimulating the economy, plus the environmental benefits are tremendous-and essential right now. You can read all about Bill’s road trip with the students from Unity here.